While Bolsonaro did come to Davos to hold a short presentation, shutdown constrained Pompeo, who spoke via live stream. In his speech, the far-right president, who took office on 1 January, told the audience that he is aiming to present to the world a new and different Brazil – a safe, secure, open, trusted and fully integrated member of the global community. “We want a great Brazil and we open our arms to the world,” he said in a bid to put his country back on the investors’ radar. He outlined a suite of reforms his new administration is planning: pushing forward privatisations, reducing the size of the state, lowering taxation level, as well as creating greater business opportunities. “We wish to govern by example and we want to deepen our integration with the global economy. We represent a turning point in the eyes of the Brazilian people,” he said. He described this “turning point” as a political transformation that “is not of a Bolivian type, as has been the case in Brazil until very recently”, he said. “Left wing will not prevail in South America,” he added. Bolsonaro has been openly hostile to left-wing ideas. Brazil already has the eighth-largest economy and the sixth-largest population, he stressed. “We are committed to becoming one of the top 50 countries in which to do business at the end of my mandate,” the pro-business president said. 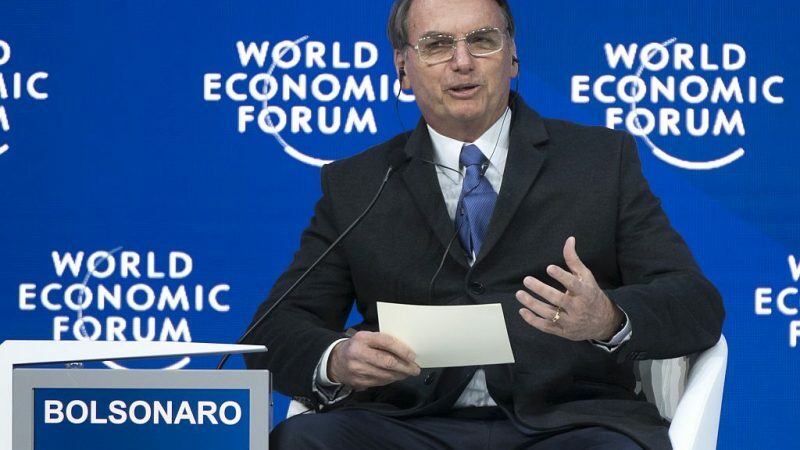 While openly denying climate change, Bolsonaro said in Davos that he was aiming at decarbonising the country’s economy. “We want that economic growth and the environment go hand in hand,” he said, adding that a key focus will be on balancing environmental sustainability with economic growth. “Brazil is the country that most preserves the environment,” he said, without elaborating. Commenting on Bolsonaro’s speech, IHS Markit’s chief economist, Nariman Behravesh expressed his surprise at how short it was, but gave it a cautious approval. “It was only seven minutes. But, in those minutes, he made it quite clear that he was going to pursue a pro-business agenda including lowering the tax burden, reducing regulation and tackling corruption. Like so many leaders in the past, he made a plea for global business leaders to invest in Brazil. It was a little disappointing that there weren’t many specifics about what he was going to do, but certainly the broad goals were very encouraging,” he said. “Bolsonaro was asked about his prior unfriendly comments regarding environmental policies. His answer was that the goal of environmental protection needs to be balanced against the goal of economic development,” Nariman Behravesh added. Speaking via video conference shortly after Brazil’s leader, US Secretary of State Michael Pompeo said Trump’s administration was aiming for low taxes and streamlined regulations. “Among the population, there is a rejection of red tape, a rejection of high taxation, and a rejection of low expectation. 2% growth was the new normal, now we have a 3% growth,” he said. “Wages are on the rise again, there are more job openings and women unemployment is decreasing,” he added. Commenting on the current global political stage, he said new winds were blowing throughout the world. Referring to Brexit, the rise of the Five Star movement in Italy, the election of Jair Bolsonaro or that of Emmanuel Macron, Michael Pompeo called these developments positive. “These are interesting times we are living,” he said. Keep dreaming about lower taxation, your dream will come to an end once marginal tax rates are implemented at 70%!